The role of the rhetorical claims needs to be considered in this intertwined scientific and political matter of the rights to the area under the Arctic ice. By a "rhetorical claim" we refer to the the political use of language in which territories are claimed by stating unsettled political facts as closed knowledge through a certain choice of words. Rhetorical claims are related to but independent of the scientific facts. As we shall see, rhetorical claims work as standardization devices in the way they leave out disagreement and implement a certainty on the area. In order to illustration how political institutions frame the unsettled territorial clams, we have made two word clouds in which we analyze and compare text parts of the official Canadian and Danish institutes that deal with the Arctic. We made these maps by copy-pasting the text from the sources into ManyEyes and visualizing the data as word clouds with a chosen word as startingpoint. The source of the upper word cloud is three subpages of the Canadian Northern Strategy program. 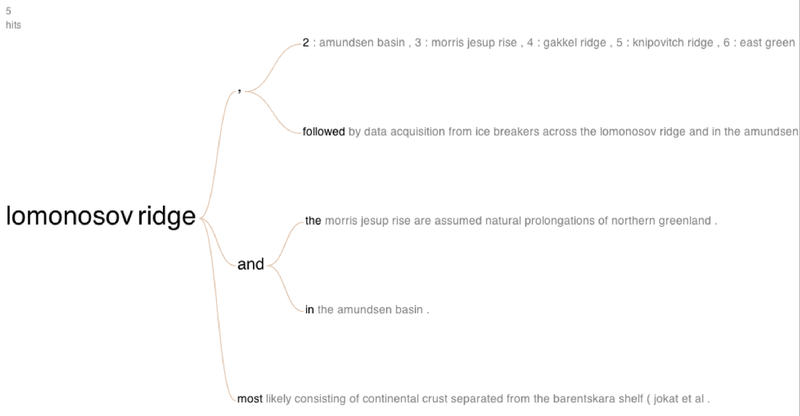 The lower word cloud investigates a GEUS article (Danish Geological Survey). An analysis of the word clouds follow beneath the pictures. “Canada has the sovereign rights to explore and exploit natural resources of the seabed and subsoil of the continental shelf beyond our eez”. Canada is stating it's right to exploit the seabed and subsoil as a fact and leaving out the mentioning of the controversy with the other Arctic coastal states and thereby excluding any kinds of uncertainties. Neither are the measurements of how much beyond the eez mentioned which is the central issue of the scientific controversy. By stating information as facts and leaving out the fact that some things are not yet facts, Canada is rhetorically self-asserting its rights to territory claims. In the Danish word cloud, the word tree starts at "Lomonosov Ridge", as it is a central part of the Danish territorial claim to the Arctic ocean floor. Only two hits showed, when the starting point was "Denmark". “Lomonosov Ridge and the Morris Jesup rise are assumed natural prolongations of Northern Greenland”. “Lomonosov Ridge most likely consisting of continental crust separated from the barentskara shelf”. As for the case of the Danish and Greenlandic report, the language is less fact-stating but instead framing unsettled knowledge as common knowledge. The rhetorical use of “are assumed” and “most likely” makes the uncertainties harmless in the way that they are pointing to a scientific process that may be undone but where consensus is to be found politically.